The Riverside team at the finish line in Annapolis, Md. Exhausting only begins to describe the Race Across America , considered to be one of the hardest endurance challenges in the world. Riders are faced with a non-stop 3,004 mile route, 170,000 feet of climbing through 12 states, and unpredictable weather conditions. Warne is a member of the local Riverside RAAM ‘Pedal to Empower Victims of Domestic Violence’ team, which claimed first place in eight-person open and second overall in the competition overall, going from Oceanside, Calif., to Annapolis, Md., in five days, 23 hours, and 51 minutes. The team, made up of Pat Kelly, the team founder and a West Newbury resident; Subramani Venkatesh and Katherine Brown of Amesbury; Sean McCarthy, Matt Merkel, and Wade Greene, all of Newburyport; and Ben Sawyer of Wenham all ride out of the Haverhill and Newburyport shop, Riverside Cycle. 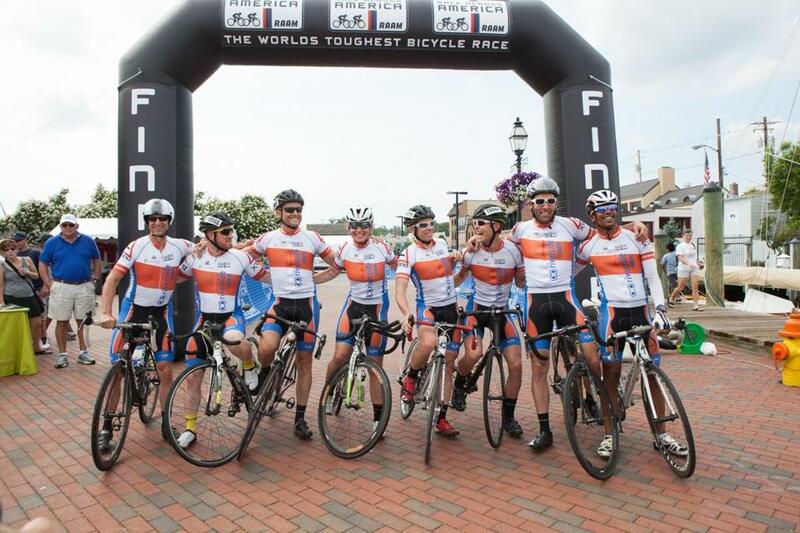 For RAAM, the team decided to ride for the Jeanne Geiger Crisis Center . The goal of the grueling competition was to raise awareness of domestic violence: According to the team’s website, they ride to illustrate the power of the human spirit when faced with adversity. The Riverside team raised $40,000 for the local nonprofit, which provides advocacy and support to families and victims of domestic violence. Based in Newburyport, it also has a site in Amesbury. Kelly, the founder of the team, was the one to choose the crisis center as the team’s charity. Kelly said he was drawn to the center by how it is managed and in the hopes to draw more attention to the issue of domestic violence. The center created the nationally acclaimed Domestic Violence High Risk Team Model in 2004 in response to the death of one of its clients. The model identifies high-risk victims and cases, which are then monitored by a multidisciplinary team that creates case-specific intervention plans. CEO Suzanne Dubus said the greater Newburyport community suffered eight domestic violence related deaths in the 10 years before the model. In the 12 years since, there have been no domestic violence related homicides. According to Dubus, the center has already attracted new donors because of the race. “There was a lot of support and enthusiasm from the public, particularly our local community,” she said. Despite the 115-degree weather in the Mojave Desert, the unforgiving winds in Kansas, and the incredible amount of sleep deprivation, the donation to the center and the miles covered made it all worth it. If you or someone you know is experiencing domestic abuse, call the Jeanne Geiger Crisis Center hotline at 978-388-1888. Advocates are available 24 hours a day. Alexandra Malloy can be reached at alexandra.malloy@globe.com.